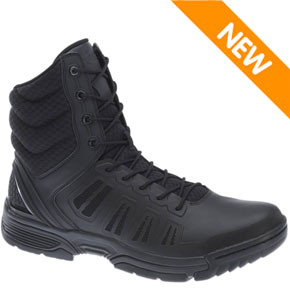 The Bates Special Response Tactical (SRT) Boot is a new generation of footwear for law enforcement and security service personnel. These boots are built lightweight for professionals that need to move out. The easy to clean molded DuraFLEX uppers are built for easy cleanup and will not crack or stretch over time. The SRT boot will keep you looking professional all day long with the comfort of a running shoe. A cushioned EVA insole absorbs shock when engaged in intense physical activity. These boots were delivered to my doorstep 4 days after ordering. :) After putting these on, the first thing I noticed was how form fitting these boots are. The low profile of these have definitely made me more agile compared to wearing regular combat boots. I've had them for about a week now and no major complaints. Break in was fast. The build quality seems good and I expect these boots to last me a while.